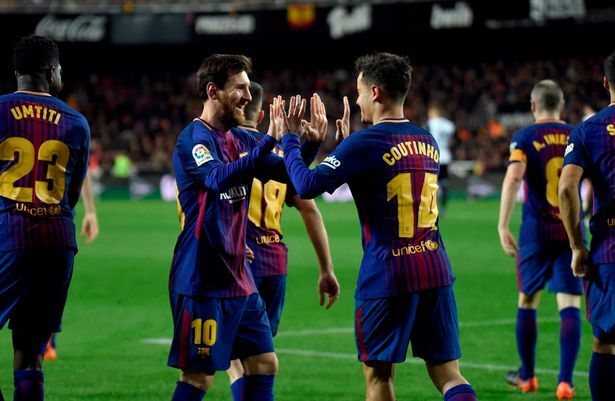 Record signing Philippe Coutinho came off the bench to score his first goal for Barcelona as they reached the Copa del Rey final with a 2-0 win at Valencia, progressing 3-0 on aggregate. Coutinho was brought off the bench at half-time for his fifth appearance since his £142million switch from Liverpool last month and scored four minutes after the restart, sending the ball into the corner of the net having slid to meet Luis Suarez’s cross. Ivan Rakitic, also teed up by Suarez, then added the visitors’ second in the 82nd minute to secure progress to a showdown against Sevilla in what will be defending champions Barcelona’s fifth consecutive Copa del Rey final. Lionel Messi – restored to the side having only made a substitute appearance in the 1-1 LaLiga draw at Espanyol on Sunday – saw an early free-kick saved by Jaume Domenech. Barcelona then had a scare as Rodrigo headed against their bar around the quarter-hour mark. Valencia threatened again in the 28th minute when Rodrigo’s shot was saved by Jasper Cillessen. Messi hit an effort just wide, and the closing stages of the first half saw Suarez miscue a shot inside the box, allowing Domenech to gather, before Valencia’s Geoffrey Kondogbia sent a shot into the side-netting having combined with Daniel Parejo. Barcelona changed things at the interval by bringing on Coutinho for Andre Gomes, and the Brazilian made a near-instant impact as he got his right leg to Suarez’s cross from the left to send the ball across Domenech and in. Suarez then curled an effort wide before Valencia substitute Carlos Soler went close at the other end, shooting the wrong side of the post. Barcelona were soon back on the front foot and Messi’s shot was parried by Domenech, with Gabriel and Ezequiel Garay then thwarting Messi and Rakitic. Coutinho tried his luck from outside the box, with Domenech making the catch, and Cillessen pulled off a superb save to deny Jose Luis Gaya. Rakitic then confirmed it would not be Valencia’s day as he lashed in having received the ball from Suarez, who had claimed possession by seizing on a misplaced Gabriel pass.